the great horse on—Hi-yo Silver! the loud reverberations of his shots. the rising night wind in his wake. carried us through the dark. © 2010 by Penny Harter. From her forthcoming collection, Portal. 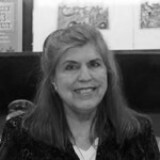 Penny Harter is a poet and teacher whose work appears in many print and on-line journals and anthologies. She has received fellowships from the NJ State Council on the Arts, the Poetry Society of America, and the Virginia Center for the Creative Arts, received the William O. Douglas Nature Writing Award, and was invited to read at the 2010 Geraldine R. Dodge Poetry Festival. After her husband's death in October, 2008, Penny moved to the South Jersey shore area to be near her daughter and family; her chapbook of poems about processing grief, Recycling Starlight, will be out this fall. Learn more about Penny here. Thanks for your insightful and kind comments about my poem! I love a poem like this one that takes me to a different reality and lets me become a participant in that world. So much more is revealed, though, than just a sense of place. The human connections that make life worth living breathe between the lines of this piece. I love a poem like this one!